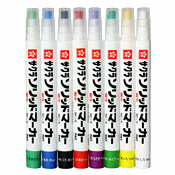 Question: Are these a different formula compared to the regular/classic Sakura solid marker? Is the mini streak more permanent? Thanks Art Primo you are the best customer service and business in the WORLD! Answer: (AP Reply) They are all pretty darn similar. The miniature size is really what sets it apart... That and the awesome array of colors!